Last week i finished a first final version of my script CSong (Current Song). 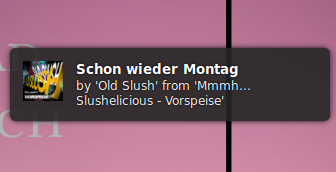 CSong is using the Ubuntu notification system, to show which song is currently played in Banshee. Once in a while I want to check what is the title (or the artist / the album) of the song, that is currently played, without opening Banshee. The actual version shows the title, artist and the album (with cover art). Of course only if the song tags are set correctly. If the song is changed, the bubble is updated as well. The current song is now shows in a bubble if you use the command csong in a terminal. I have set a keyboard shortcut, to have good access to my song information all the time.